We have questions regarding the installation of the Diagnostics Agent with help of Software Provisioning Manager (SWPM). When performing installations as described here, SWPM will ask for a kernel with following label: UC Kernel NW731. The mentioned kernels are compatible to the requested one. In addition, the Diagnostics Agent PAM information for SWPM (>=) 1.0 SP3 must be respected. This PAM information is documented in the PAM document for SL Toolset (>=) 1.0 SP8. This PAM documentation can be accessed via: http://service.sap.com/sltoolset, Software Logistics Toolset 1.0 and PAM. 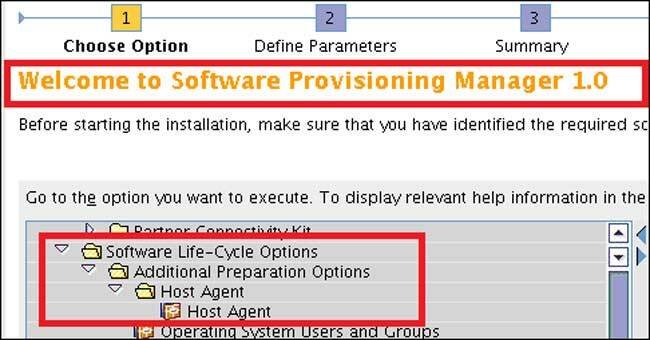 You install a Diagnostics Agent with SWPM 1.0 SP3 or an earlier installer version, and you want to connect to SAP Solution Manager on HANA. An error Message Box gets displayed saying: Make sure that the JEE engine is deployed correctly. Choose "Cancel" to modify managing configuration or "OK" to continue. If you choose to continue you will have to execute the smdsetup script later on. The key deploy is not register in the JNDI registry. Please make sure that the SAPJ2EE engine is deployed. Despite the reported ERROR (12), and under the assumption that all provided parameters are correct, "OK" to continue must be selected here. The installation will continue and finish correctly. The Diagnostics Agent will connect to the Solution Manager system, and it can be used. Alternatively, you can decide to not connect to the Solution Manager system during the installation phase, and use the smdsetup script to establish the connection instead. During the installation the installer asks for SSL Libraries. This should not occur in recent installers (SWPM 1.0 SP2, Standalone Installer 7.30 SP3, and respective successors). Very likely (especially in the case of SWPM), the wrong kernel archives have been provided during the installation procedure. For SWPM SPs there usually is a matching SWPM SP specific kernel version that must be used. Details are documented in SWPM Master Question: 1680045. On SOLARIS, after entering a virtual hostname on the respective screen, SAPinst reports following error: "The host with the name is not a virtual hostname on the local host." During the installation on Windows platforms, the installer warns that a reboot is required. The message is like: "Running msiexec finished with return code 3010: The requested operation is successful. Changes will not be effective until the system is rebooted." The sapinst_instdir*sapmmc*.log (for example: sapmmcX64u.log) holds details about files that are in use and thus could not be updated. MSI (s) (DC:98) [time]: Product: SAP MMC SnapIn. The file C:WINDOWSsystem32sapmmc.dll is being held in use by the following process Name: mmc , Id 4200. Info 1603. The file C:WINDOWSsystem32sapmmc.dll is being held in use. Close that application and retry. MSI (s) (DC:98) [time]: Product: SAP MMC SnapIn. The file C:WINDOWSsystem32sapmmcms.dll is being held in use by the following process Name: mmc , Id 4200. Info 1603. The file C:WINDOWSsystem32sapmmcms.dll is being held in use. Close that application and retry. MSI (s) (DC:98) [time]: Product: SAP MMC SnapIn. The file C:WINDOWSsystem32sapmmcada.dll is being held in use by the following process Name: mmc , Id 4200. Info 1603. The file C:WINDOWSsystem32sapmmcada.dll is being held in use. Close that application and retry. MSI (s) (DC:98) [time]: Product: SAP MMC SnapIn. The file C:WINDOWSsystem32librfc32u.dll is being held in use by the following process Name: mmc , Id 4200. Info 1603. The file C:WINDOWSsystem32librfc32u.dll is being held in use. Close that application and retry. MSI (s) (DC:98) [time]: Product: SAP MMC SnapIn. The file C:WINDOWSsystem32sapmmcdb6.dll is being held in use by the following process Name: mmc , Id 4200. Info 1603. The file C:WINDOWSsystem32sapmmcdb6.dll is being held in use. Close that application and retry. This is caused by the fact that the SAP Management Console is already installed and running on the system, during the execution of the installation procedure. Make sure that the SAP Management Console is closed before you start the installation procedure. MSI (s) (DC:98) [time]: Product: SAP MMC SnapIn. The file C:WINDOWSsystem32librfc32u.dll is being held in use by the following process Name: sapstartsrv , Id 8200. This situation must normally not occur. It indicates an incorrectly configured system. Application sapstartsrv should not access librfc from the system32 directory. Please open a ticket on component on BC-OP-NT. Compared to Diagnostics Agent standalone installer 730 SP2, the 730 SP3 standalone installer and SWPM based installers, do not allow you to install Diagnostics Agents with instance number 98. The here described solution must only be used for installing Diagnostics Agents. The instance number 98 can be used for Diagnostics Agent installations, but it is also strictly reserved for these. Installing SAP (Systems, Applications, Products in Data Processing) systems that are not Diagnostics Agents, based on the here described solution and with an instance number 98, may lead to serious problems with future Lifecycle Management, Software Logistics, Upgrade and Update procedures. The here described manipulation of the installation media must be reverted or deleted, as soon as the Diagnostics Agent installation has been completed. Running the smdsetup script generates an error like the one below. Could not find the main class: com.sap.smd.setup.SetupMaintenance. Program will exit. This error is generated when the smdsetup script is run right after the installation, during the phase where the Diagnostics Agent binaries are being updated. The latest version of the binaries are downloaded from the Solution Manager system to which the Diagnostics Agent is connected. This is the intended behavior. After a restart of the Diagnostics Agent the sapcpe_sapjvm_6.log file holds an error message complaining that file sapjvm_6.lst does not exist. Trace level (profile): 1 *** ERROR: File-List "C:usrsapDAASYSexejvmNTAMD64sapjvm_6.1.048/sapjvm_6.lst" does not exist, 2, No such file or directory, [sapxxcpe.c:1438] parameter "all" is also not defined. Exit. The usrsapSYSexejvm directory is emptied on all platforms, as part of the installation procedure. When installing a Diagnostics Agent implicitly as part of a NetWeaver 7.40 installation, the Diagnostics Agent gets installed with a NetWeaver 7.40 kernel. In the "SMD Agents Administration => SAP Host Agent" tab, the "SAP Host Agent kernel release" will show a value of 720 though. With SWPM (>=) 1.0 SP3 you have installed a NetWeaver Java System with version 7.1 or 7.1 Enhancement Pack 1. The Diagnostics Agent was installed with SAP JVM 5 as runtime environment. If a Diagnostics Agent was installed already, uninstall it. Then, install the Diagnostics Agent as described in section 1., General Information. Invalid Response Code: (401) Unauthorized. Will produce errors on older Solution Manager systems. This problem is solved with SAP Solution Manager 7.10 SP9. In addition: "smdsetup supportlogs" may not work, if you have decided to not connect the Diagnostics Agent to an SLD, and to not connect the Diagnostics Agent to the Solution Manager system directly. Issues with "smdsetup supportlogs" will disappear when connecting the Diagnostics Agent to a Solution Manager 7.10 SP9 or higher, using the "smdsetup managingconf" command. This behavior also occurs with SAP SOLUTION MANAGER ON HANA, which is derived from Solution Manager 7.10 SP8. Update to SAP Solution Manager 7.10 SP9 or higher. You have logged on to the host as user adm. When checking (activating) the "Use SSL Connectivity" checkbox, for installations that do not use the SWPM Kernel for your SWPM version (e.g. SAP NetWeaver 7.4 installation), you will get an error Message Box with following message: Unable to create JNDI environment. Choose "Cancel" to modify managing configuration or "OK" to continue. If you choose to continue you will have to execute the smdsetup script later on. - Direct P4 connection via Java EE dispatcher node and when not specifying the User and Password information at "Credentials (optional)", the installer will display a Message Box with following error message: An error occurred while processing option Solution Manager Diagnostics Agent > SAP Systems > Standalone Engines > Diagnostics agent in SAP Solution Manager > Diagnostics Agent( Last error reported by the step: TypeError: out has no properties (in script NW_DiagnosticsAgent|ind|ind|ind|ind, line 103856: ???)). When using the mentioned connections, user credentials must be specified.